Launched in approximately 1969, reference 6265 was produced alongside its sibling reference 6263. Made for less than 20 years it is believed that less than 2000 gold versions of the reference 6263 and 6265 were cased in either 18K or 14K yellow gold. From the late 1970s, early 1980s and onwards, gold examples featured a movement number engraved on the plate, behind the balance wheel. This was related to the officially certified chronometer movement. Around this period, Rolex modified the dial layout for gold versions, and the "COSC" designation was printed on the dial. 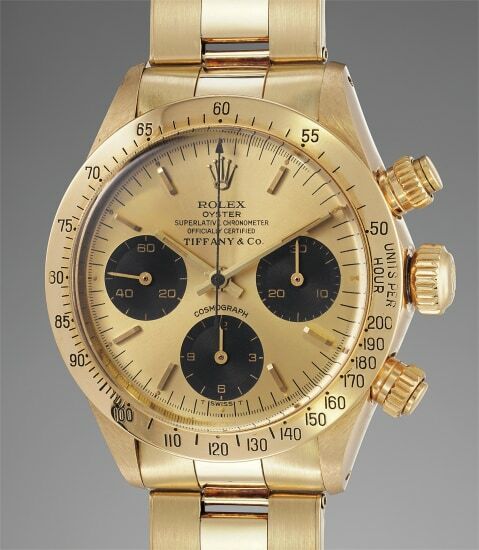 Having previously been sold at the historical Rolex Daytona "Lesson One" thematic sale, the present watch most notably features the signature of Tiffany & Co below the "COSC" text at 12 o'clock. Few retailers have a relationship with Rolex like Tiffany & Co. The jeweler has proudly emblazoned its logo on a variety of Rolex wristwatches, ranging from the GMT-Master to the Cosmograph Daytona. The present timepiece is preserved in excellent and impressive condition. The case is incredibly crisp, and all gold marks and hallmarks are present and sharp beneath the lugs. The dial itself is preserved beautifully, with the subsidiary registers starting to turn a slight brown hue.